Hey guys! I feel like the course I'm using to navigate this month's #CBBxManiMonday theme of "Nails We Don't Normally Do" is to find nail art techniques or styles that are outside of my comfort zone and shift them into it, if that makes sense. I've never put jewels on my nails before and I honestly kind of thought that I never would, because I was convinced that they would be cumbersome and inconvenient. When we decided on this theme for the month, this is actually one of the first things I thought of, because it couldn't be further outside my comfort zone, I think. I started with a coat of Unt Ready For Takeoff Peel Off Base Coat and followed with two coats of Girly Bits The Shaft, which is a bronzey mauve holo shade that's really, really gorgeous and very in my wheelhouse. 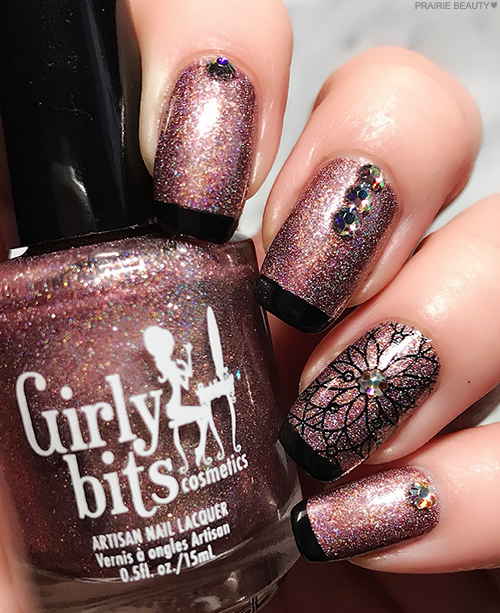 For my accent nail, I went in with the Maniology (Bundle Monster) S301 Festival Stamping Plate and one of my all time favorite stamping images, because I knew that it would work perfectly with a jewel placed in the center of it and I knew that's what I wanted to do. I used Born Pretty Store Black Stamping Polish for the image as well as the tips, which I applied with a fine liner artist brush. 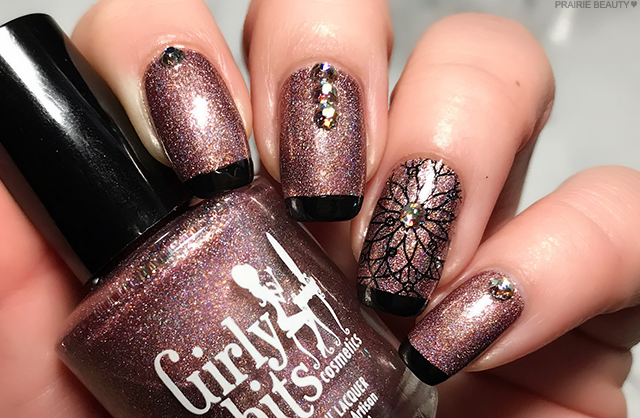 I decided that if I was going to do jewels on my nails, I was going to do it right, so I went straight to Swarovski crystals. I wasn't entirely sure which ones to buy, so I stared at the display in Michaels for a long time, but ultimately I settled on Swarovski 3mm Xirius Hotfix in Silk Shimmer. I wanted them to be quite small and delicate, but have a lot of dimension, and these ones are seriously gorgeous. I used a small dot of top coat to ahere them where I wanted them - in the center of the flower and at the base of each nail in the center - before finishing with a generous coat of Essence The Gel Polish Top Coat. And voila! Honestly, I really didn't think I was going to like this mani or ever want to have crystals on my nails again, but I actually really think i looks beautiful and I love the way the colours in these particular crystals really play well against the base polish. It's a simple mani, really, but it's not one I ever would have done before and definitely pushes me outside of my comfort zone. 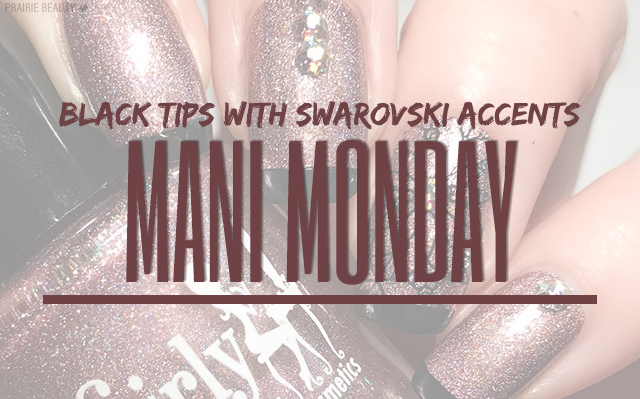 Don't forget to head over to Tea & Nail Polish, Cosmetic Proof, and See The World In PINK today to check out what the other #CBBxManiMonday ladies are wearing on their nails!